Catholic Business Leaders (CBL) provides a unique, Catholic faith and business learning experience for family enterprise owners and corporate executives, rooted in the dignity of work, and in the spirit of community philanthropy. 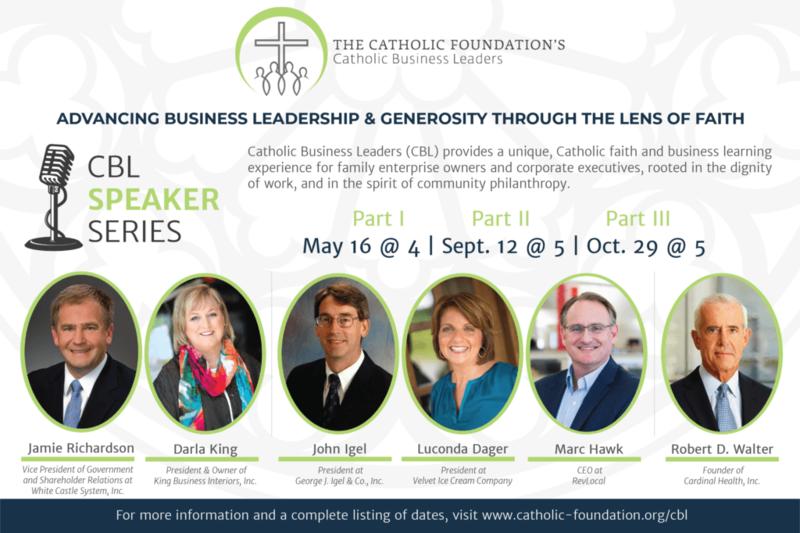 Catholic Business Leaders offers a Three-Part Speaker Series every year, hosted at The Catholic Foundation. *These events are free to attend. Acquire new insights and perspectives from regional enterprise speakers and national subject-matter experts. Exchange and discover new perspectives and solutions that impact your workplace, and benefit your home and family. Network among peers, make new connections, help build a larger, Catholic business community throughout Central Ohio. dynamics, at work and at home, across generations. Discover the pros and cons of leading family business life-cycles, with personal insights from other leaders’ own experiences. by its impact throughout the community.